"I keep black beans on hand, and when I'm exhausted and don't feel like cooking for my family, I pull out this recipe. So easy to remember, make it once, and it's in your head forever!" Bring rice and water to a boil in a saucepan. Reduce heat to medium-low, cover, and simmer until the rice is tender and the water has been absorbed, 20 to 25 minutes. Allow rice to stand covered for about 10 minutes. Mix salsa with black beans in a microwave-safe bowl, and cook in microwave oven on high until hot, about 2 minutes; stir once or twice during heating. Divide cooked rice into individual serving bowls. Top the rice with black bean mixture, chicken strips, and Cheddar cheese; garnish with fresh cilantro and dollops of sour cream. Excellent recipe. I did up the salsa to 1 full cup to give it a little more zing. It was a big hit and I had requests for the recipe! This has become a new family staple. It is SO easy and really good! 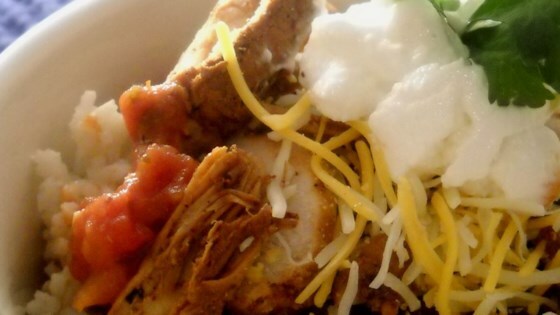 We loved this recipe.....I served corn tortillas with it and it was outstanding. I added half a cup of salsa instead of the 1/4 cup.